In deep fryer or large heavy saucepan, heat 2 inches oil to 375°F. Meanwhile, in small bowl, gently mix chicken, buffalo sauce and ranch dressing, tossing to coat chicken. Separate dough into 10 biscuits; press each into a flat round. 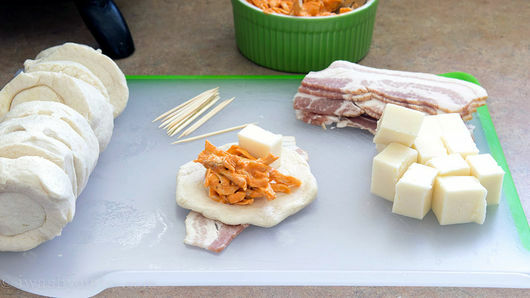 Cut each slice of bacon in half crosswise. To make each bomb, place 1 large tablespoon chicken mixture in center of flattened biscuit. Top with 1 cheese cube. Pull edges of biscuit up and over filling; pinch seams to seal securely. 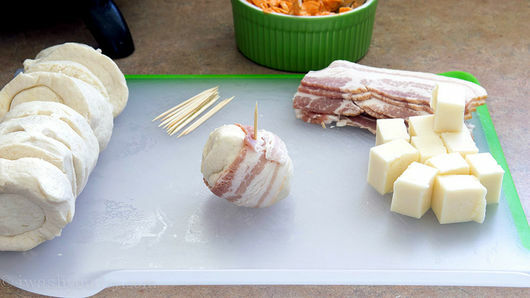 Wrap 1 half-slice of bacon around bundle; secure with toothpick. Gently place bundles in hot oil; fry 4 to 5 minutes or until golden brown on all sides. Drain well on paper towels. Serve warm. 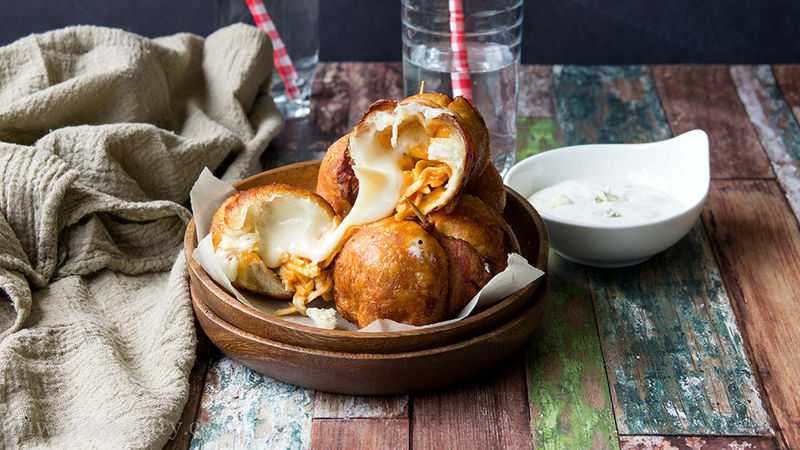 Sneak little bits of crumbled blue cheese into each bomb for a flavor explosion! Not down with the buffalo? Switch it up with some of your favorite barbecue sauce, and then sub the mozzarella for equal amounts Cheddar cheese!